Constant Output AMP® ControlPro™ 200 LED Downlight - an integrated LED fixture with advance design features. The AMP® Control Pro™ 200 LED Downlight is a low voltage, professional-grade landscape light designed specifically for downward-facing applications. With solid cast brass construction and a uniquely engineered body, this fixture represents the most durable and best performing LED downlight of its kind. The product is equipped with interchangeable optics so the designer can change beam spreads in the field. The fixture can be mounted and aimed quickly. Overall, with features aimed to enhance performance and streamline installation, this LED downlight is the preferred choice for nearly all downlighting needs. Applications include mounting the fixture in trees for a moonlighting effect and mounting under eaves or gutters to provide a wash light on architectural surfaces, pathways, and plant material. The fixture is also ideal for downlighting from beams in gazebos, pergolas and arbors. Fully Integrated LED Light Source. Sourced with tightly-binned Cree® LED chips and AMP®-engineered circuitry, the LED light source is designed to deliver a warm white beam with high lumens and consistent color. Interchangeable Optics. Fixture is equipped with two optics that can be quickly and simply exchanged in the field. This gives the designer flexibility to change beam spreads as the project requires. Zero Water Intrusion. Patent=pending fixture design has wire entering fixture from below – bypassing the knuckle and ensuring no water intrusion. One-Handed Installation. Since downlights are often installed from atop a ladder, the propriatary one-handed mounting bracket ensures a safe installation. This mounting system also prevents damage to the tree. *Constant Output. Unlike the AMP® ONE ControlPro™ 200 Downlight, this fixture is non-dimmable. 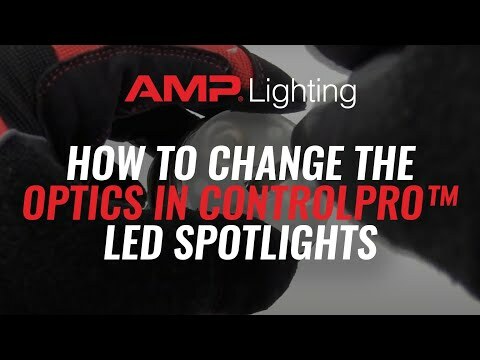 It is offered as a cost-saving alternative for designers who do not need the remote dimming function of the AMP®ONE series.